There’s an interesting event happening this Saturday from 1:00 to 5:00 in Boston. Since there are a bunch of North Shore connections, and it’s all about local food, we thought you’d want to know about it. Maggie Battista, a fabulous local writer and photographer, is one of the minds behind Eat Boutique. The event is the company’s first Boston Local Market, featuring food purveyors and cookbook authors. Newburyport’s Chococoa Baking (gourmet whoopie pies) and Essex’s Lark Fine Foods (cookies for grownups) are among the participants. Ipswich’s Didi Davis Artisan Foods will be displaying their inventive condiments. Not from the North Shore, but certainly of interest to foodies, are Arlington’s Quinn’s Popcorn, Somerville’s E.H. Chocolatier, Vermont’s Fat Toad Farm (goat milk caramel sauce), The Stand (drink syrups and preserves), The Wine Bottega, and The Cupcakory. Joanne Chang of Flour Bakery will be signing her cookbook from 1:00 to 1:45. Amy Traverso, senior lifestyle editor at Yankee Magazine and author of the just-released The Apple Lover’s Cookbook, will be signing her book from 2:00 to 3:00. And Amy McCoy, author of Poor Girl Gourmet: Eat in Style on a Bare Bones Budget, will be at the market all afternoon sharing sample items from her cookbook. 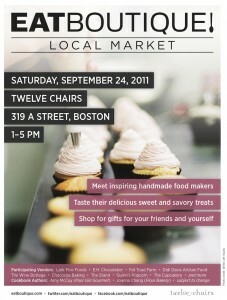 The market will be located at Twelve Chairs, a design shop and studio at 319 A Street in Boston. Attendance is free, but please let Eat Boutique know you’ll be there by signing up here.